The management of technological innovation (MTI) is one of the most important challenges facing businesses today. Innovation has become the fundamental driver of competitiveness for firms of all sizes in virtually all business sectors and nations. The first edition of this book has become one of the most popular texts for students of innovation and technology management. This new edition sees David Gann and Ammon Salter join Mark Dodgson as authors, drawing on their combined experience of 60 years of researching and teaching MTI. It combines the most relevant theoretical analysis with contemporary and historical empirical evidence to provide a comprehensive, yet concise and readable, guide to the challenges of MTI. By explaining the innovation process the book reveals the broad scope of MTI and its importance for company survival, growth and sustainability. It describes how MTI has to be managed strategically and how this is successfully achieved by formulating and implementing strategy and delivering value. Chapters provide frameworks, tools and techniques, and case studies on managing: innovation strategy, communities, and networks, R&D, design and new product and service development, operations and production, and commercialization. Based on robust analysis, the book provides a wide range of empirical evidence from a huge diversity of case studies, with around fifty case studies newly written for this edition. It analyses MTI in all parts of the world, in companies large and small, and in services, manufacturing, and resource-based business sectors. This new edition has been fully revised and updated to reflect the latest teaching and research, and to ensure its continuing relevance to the contemporary world of MTI. It will be an important resource for academics, students, and managers throughout the world, is a recommended text for students of innovation and technology management at postgraduate and undergraduate level, and is particularly valuable for MBA courses. 1. 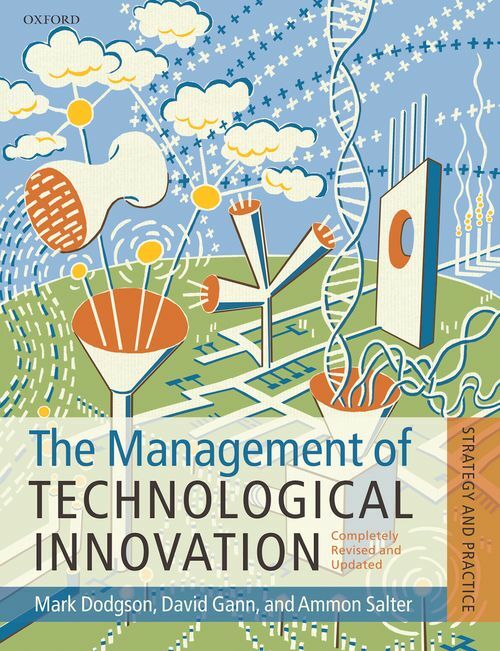 What is the Management of Technological Innovation and why is it Important? Mark Dodgson is Director of the Technology and Innovation Management Centre at University of Queensland Business School and Visiting Professor at Imperial College Business School London. He was previously Senior Fellow at the Science and Technology Policy Research Unit at the University of Sussex (1985-93), and Professor of Management and Executive Director of the National Graduate School of Management at the Australian National University (1993-2002). Mark is a Fellow of the Royal Society of Arts and the Academy of the Social Sciences in Australia. He is an International Fellow at the UK's Advanced Institute of Management Research. He is the author of 10 books on innovation management and policy. Mark is a member of the Editorial Board of 8 academic journals, including Research Policy. Mark is a Director of the TPD Group. ; David Gann heads the Innovation and Entrepreneurship Group at Tanaka Business School (TBS), Imperial College London. He holds the Chair in Innovation and Technology Management jointly at TBS and the Department of Civil and Environmental Engineering. He is responsible for a large research portfolio, with many projects involving collaborative agreements with firms and organisations in design, manufacturing, engineering, construction, ICT services and healthcare industries. He is Director of the EPSRC funded Innovation Studies Centre and the Innovation and Productivity Grand Challenge. David is a member of the Advisory Panels of Computer Science Corporation and Laing O'Rourke. He is Chairman of the Think Play Do Group a spin-out company from Imperial College and University of Queensland. He holds an Honorary Professorship at the University of Queensland and is Visiting Professor at Southampton University. David is a Fellow of the Royal Society of Arts. ; Ammon Salter is a Reader at the Tanaka Business School, Imperial College London and a Ghoshal Research Fellow of the Advanced Institute of Management Research. He is the co-director of the EPSRC-funded Innovation Studies Centre. He holds a D.Phil. in Science and Technology Policy from SPRU - Science and Technology Policy Research at the University of Sussex. He worked at SPRU from 1998 to 2002, as part of the Complex Products and Systems Research Centre (CoPS). Ammon's research has been sponsored by variety of governments, including HM Treasury, the Department of Trade and Industry, the European Commission, the Russell Group of Universities, and the Ove Arup Foundation. He also has worked closely with a range of industrial organizations, including Sun Microsystems, Arup, Ricardo and Atkins. He has published in a wide range of leading journals, including the Cambridge Journal of Economics, Strategic Management Journal, Industrial and Corporate Change and Research Policy.